Customers – please stay at home! We read a lot about how local shops need good convenient free nearby car-parking and how out-of-town shopping and internet shopping are creating difficulties for the high street. 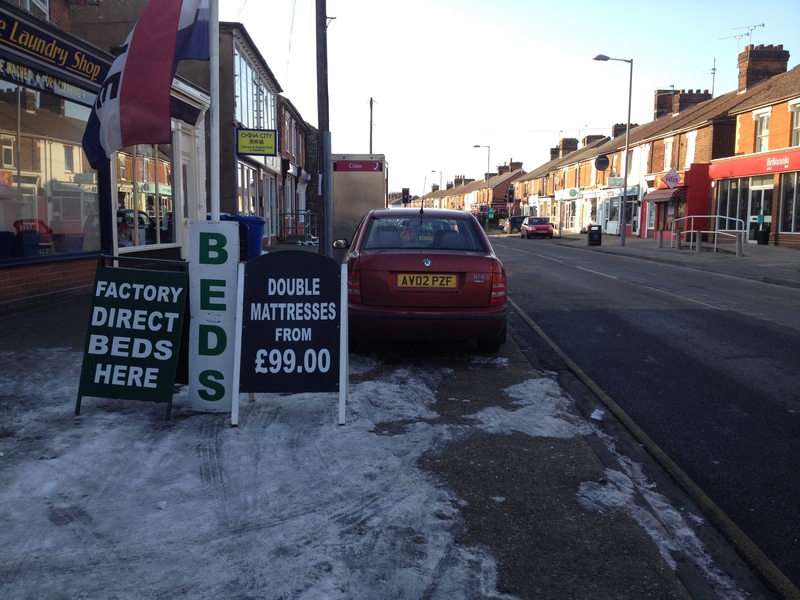 So let’s see how one section of high-street is managing to attract customers in this cold weather we are having. Fyi, it snowed 6″ a week ago and hasn’t done so again at all since then. 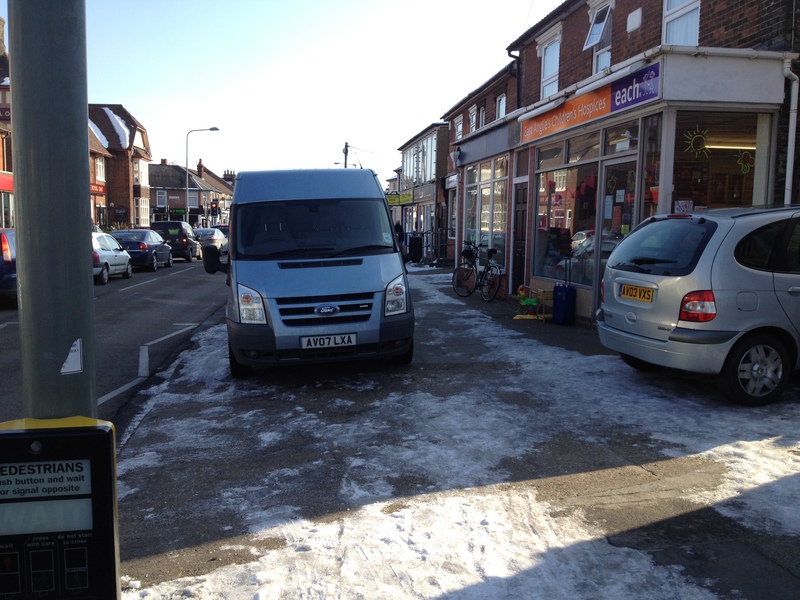 If the shop-owners had cleared it on the first day they would have had a clear pedestrian approach all week. My story takes place along this row on shops is on the south side of Felixstowe Road at the junction with Derby Road in Ipswich (See it on Google streetview). 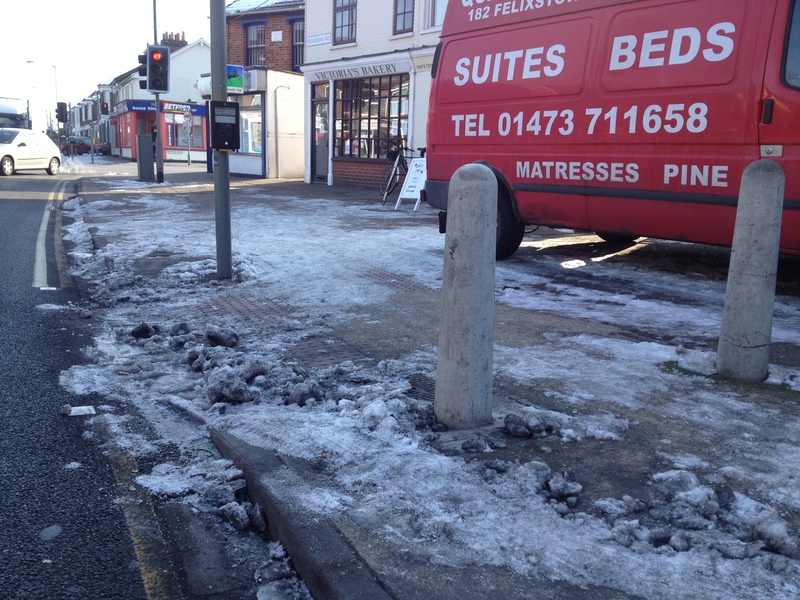 Being on the south side does of course mean that they have had no sun on the pavements to help clear them. 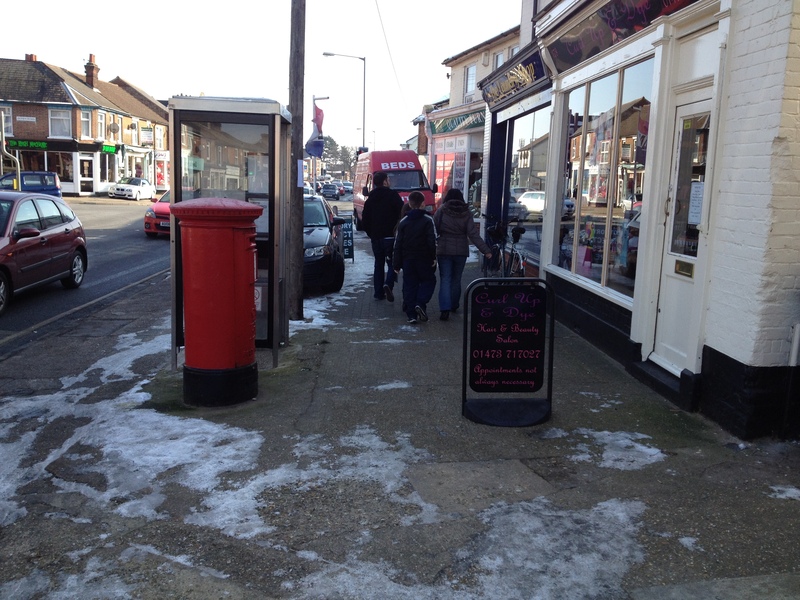 You should also be aware that the legal footway stops in front of the post-box and telephone box. The land behind is private property and the shop-keepers can do what they like with. The footway should be keep clear for pedestrians, however they are would probably get more custom by attracting people to walk past their doors. Interestingly, they could also be legally liable for anyone who slip over while coming to their shops which is not something that I think they have considered. Here is the street scene back when it was warm when the Google Streetview car came through town. 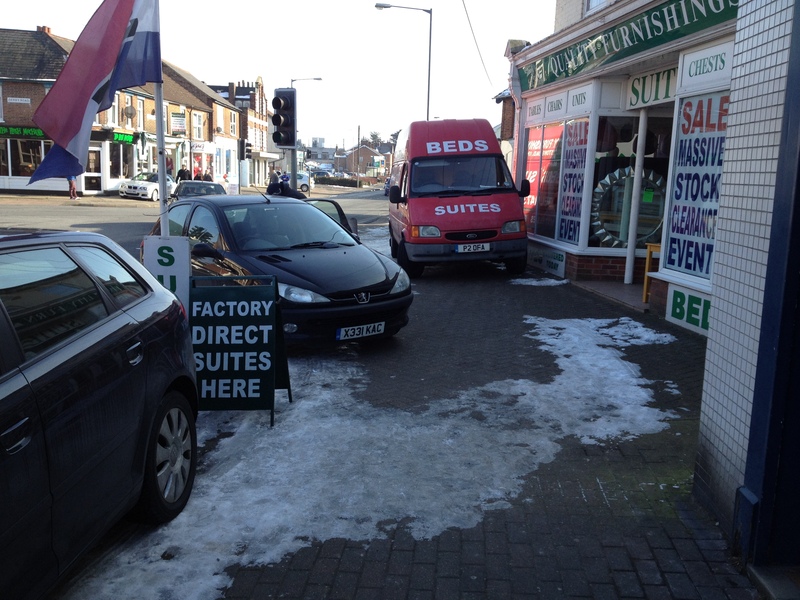 This first picture taking today shows the bed-shop van parked as normal on the area outside the bed-shop (on private property) with sheet ice on the pavement where people have to walk. 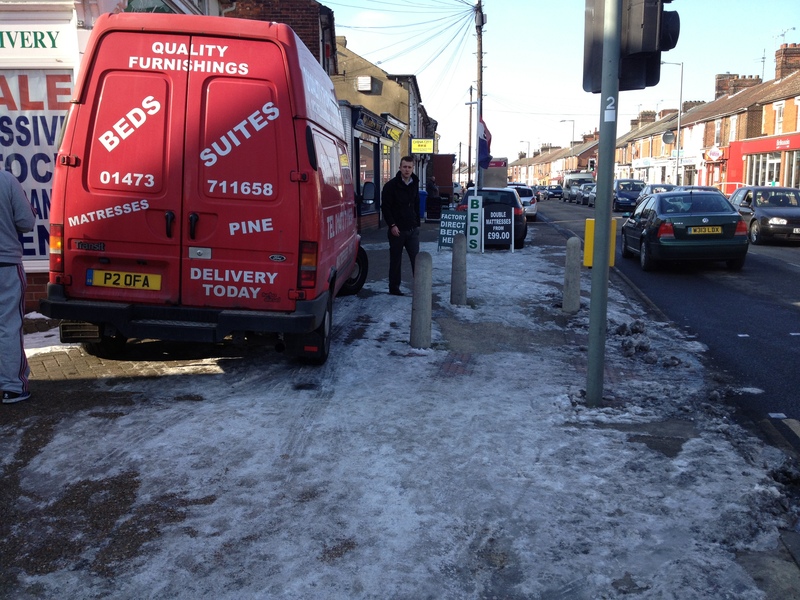 Nice crossing, shame about the sheet-ice – nice van! Here is a close up of the ice on the crossing by the van. Lots of money spent by the council on blister paving and bollards, but not effort from the locals to keep it usable this week. Trying getting across there! Why doesn’t a shop-keeper sort this? Here is a view from the other direction, the diagonal black car was ‘only going to be 2 minutes’. The other back car it probably partly partially obstructing the footway. Nice ice sheet and nice wheels. A little further along and there is the sign for the hair-dresser out across where people are walking (which is private property as the owner reminded me). I spoke to her because she had objected to my bike leaning against her shop and came out and moved it! What is a shame really that she someone didn’t come out a bit earlier and stop this driver from blocking the pavement on the zigzags of a toucan crossing with his large van. The driver explained to me that he had ‘only been two minutes’ and wasn’t interested at all. Van blocking view to toucan crossing – not concerned at all! 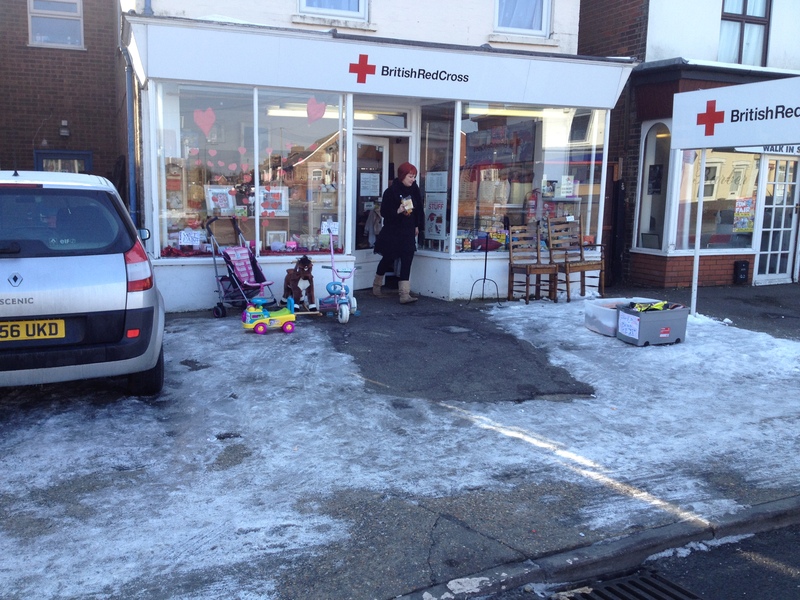 Red-cross – nope, they didn’t clear the snow – the clear bit was where a car was parked! So there you have it. Yes – a few people are able to park really close to where they are going and can then slither along like everyone else when trying to actually get to their destination. But.. no, it is not attractive and I can’t believe that there has not been a shop-keeper or shop-assistant who would not have been able to find time this week to clear it. OK, so I passed by again this afternoon. 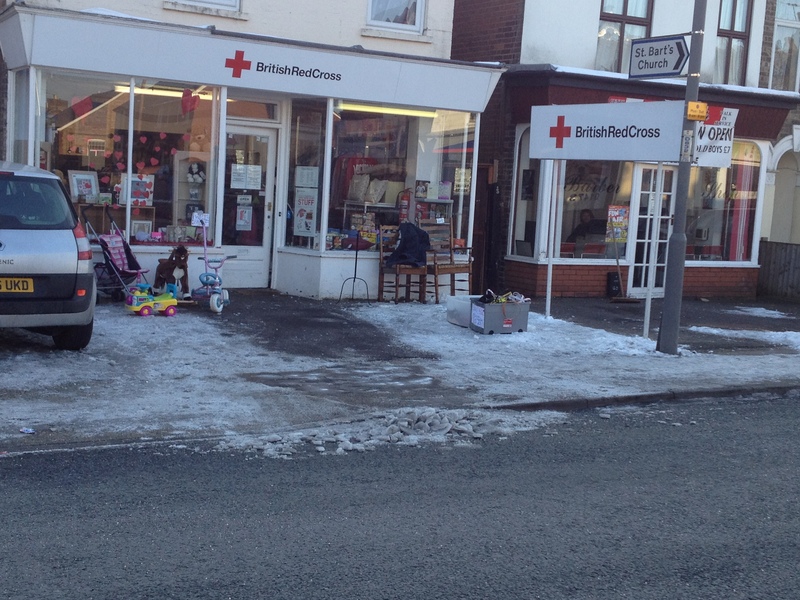 A new car had blocked the pavement joining the advertising signs, However the Red Cross shop had obviously had a re-think and cleared their access which is progress! Red Cross clear their forecourt. A success! I was amazed to see one of the inappropriate through routes for cars in the centre of Macclesfield had its pavements thoroughly gritted. It was perhaps the only concession I’ve ever seen in the town for pedestrians. Perhaps the myth about being sued for clearing the pavements is finally starting to die off.